By Barbara Dubbeldam, November 15, 2018 at 11:00 am . 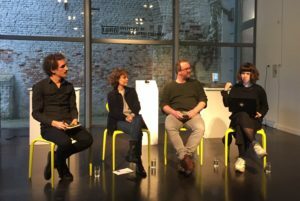 On November 10 the Institute of Human Obsolescence (IoHO) founded by artist and activist Manuel Beltrán, organized a discussion in the context of the Data Production Labor series to investigate the hidden dynamics behind our data work. There were three installations on show that visualized data labor in different ways. IoHO is an artistic research project investigating the repositioning of human labor in a time where manual and intellectual labor are increasingly being performed by machines and new forms of inequality and exploitation arise. With a series of public events the IoHO aims to create an understanding of the production of data as a form of labor. With a new understanding of our relation to work, it might become possible to negotiate the terms of data labor and claim a better position for human workers. Yes. You and me are data workers. The second we enter the web, go online, we produce data with every little move we make or don’t make. And this data is turned into Big Capital by Big Tech. And, of course you know this already or have at least a vague notion that this is how the internet works, while going about your daily business. The panel with Manuel Beltrán, Katrin Fritsch, Luis Rodil-Fernández and Ksenia Ermoshina. The investigation kicked off with a discussion about the narrative of the user. In this narrative, users of free services do not question the technology that they use. They don’t question it because, well, it’s a free service, right? Not having any expectations, users are passive and don’t feel accountable for their (micro) actions. Besides, the services are very convenient. So, from a user’s perspective, why ask questions? From this starting point the hidden infrastructures behind the seemingly innocent or simple tasks that we perform online were discussed. During this session many topics were brought up that provoked plenty of questions about the human in the loop. In an A.I. based economy digital labor is the currency and this labor is used, among other things, to train algorithms. While a lot of this labor is indeed framed as a form of labor (or Human Intelligence (micro) tasks), much of our digital work is done unknowingly. For instance, when you have to prove that you are not a robot to sign up for a newsletter, and you have to solve one of reCAPTCHA’s traffic light puzzles, you might also be training algorithms for military drones. This seemingly innocent task produced data (value) for Google and was done without consent or the possibility to negotiate what this data is used for. During the discussion the possibility of a Data Workers Union, that was founded by the IoHO in 2017, was discussed in the context of cultural differences, tradeoffs between privacy and security, political organization of citizens as users of platform governments, and more. What is to be done remains an open question that needs continuous investigation and updating. These days you can just check the ‘I’m not a robot’ box and you may proceed without making some puzzle. Or the checkbox does not even show up. By tracking your online behavior and clicking patterns Google already knows that you are not a robot. Besides, users found the security check to be very annoying. With another layer of technology moving into the background, signing up for a newsletter just became a bit more convenient and asking questions a bit harder.